Mario Cipollini, who holds the record for stage wins at the Giro d'Italia, will retire from cycling. And, this time, it may even stick. Cipollini retired and unretired in 2002, and said at the end of last season he was done, but raced through the spring with Liquigas-Bianchi, where he pulled off a satisfying victory over his spiritual successor, Alessandro Petacchi, at the Giro di Lucca. "I would have liked to be at the start of the Giro d'Italia looking for victory again, fighting for the pink jersey," Cipollini said. "Maybe, an ‘old man’ like me, who has given a lot to cycling and has also received a lot, has to recognize when is the right moment to stop. Over a 17-year career, Cipollini won 12 Tour de France stages and wore the yellow jersey for 6 days, despite dropping out every year when the race hit the mountains. The Liquigas team announced that Cipollini, nicknamed the "Lion King" would reveal further details of why he has decided to retire at a press conference in Milan on Friday. 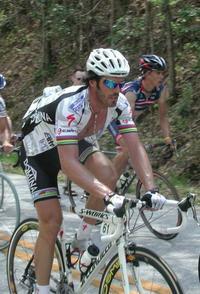 At left, Cipollini far from his native habitat, laboring up Brasstown Bald at the 2004 Tour de Georgia. It's starting to feel like a generational shift, with Cipo's retirement, Lance Armstrong's announced retirement, and Andrea Tafi's retirement. Samuel Abt offers a profile of Cipollini facing the onrushing dusk of retirement last year. Lance Armstrong flew to Italy on Wednesday to meet with an Italian magistrate about the Filippo Simeoni case. Prosecutors are investigating whether Armstrong verbally assaulted or slandered Simeoni after Simeoni testified against Michele Ferrari in his doping trial. Ferrari was convicted last year. Armstrong had worked closely with Ferrari before the doping case against him was launched, then broke off the relationship. 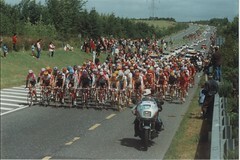 At last year's Tour, Armstrong chased down a break that included Simeoni, then told the group that he would let it escape only if Simeoni was not involved. La Gazzetta dello Sport reports that magistrates are investigating whether Armstrong asked Mario Cippollini to pressure his Domina Vacanze management to get teammate Simeoni removed from the team. That accusation apparently comes from Vincenzo Santoni, still managing Simeoni while Cippollini moved on to Liquigas-Bianchi. Simeoni also has a libel suit pending against Armstrong in France, stemming from Armstrong calling Simeoni "a compulsive liar" and saying Simeoni had been doping before he ever hooked up with Ferrari. Mario Cipollini says he'll go into the Tour de France with little more than hope for "a couple of situations where it all falls into place." Cipollini, who dropped out of the Giro after a Stage 7 fall, said "My aim is to win at least one stage. The green jersey is not an objective. I’ll take it one day at a time,” and as much as admitted he doesn't plan to ride into Paris with the peloton, but will exit when the roads turn steep. Cipollini is 37 and clearly nearing the end of his career, but where will we turn for drama when he's gone? At a press conference Saturday, Cipollini announced that, despite earlier threats, he will be riding in this year's Tour de France. "I want to be competitive at the Tour and I'm working to get fit again," Cipollini said at his first media conference since retiring from the Giro on May 15. "After my crash at the Giro d'Italia I didn't ride my bike for two weeks but now I'm training hard again." Cipollini said he wouldn't set any specific goals, but would be looking to win an early sprinter's stage and to make it all the way to Paris "if I'm riding well." Cipollini said the chances of his racing at the Athens Olympics rest on his performance in France, but that riding the Olympics is a dream of his. "I'm leaving with a sense of incompleteness," Cipollini said. "After all that I've done, it's strange, at 37, to leave with that feeling." That's Mario, his teammates responded. All he needs to set him right is a victory. Cipollini's lifestyle ... was no longer compatible with the team's regimen because he wants to sleep in suites while his teammates share rooms and "fly in business class when the rest of us are in economy." "Et cetera," Santoni added, leaving that offense unexplained. I suppose we'll know between now and July 3rd. Mrs. TDFBlog and I have never seen a mountain finish before, and decided to try our luck at the Brasstown Bald finish of the Tour de Georgia on Saturday. Traffic was moving surprisingly well until we could see the roadblock near where the 180A spur turns up the mountain, so we found a spot, and started trekking up the mountain. We got a quarter-mile or so up the side, and came to the 5-km to go banner, where not many people were lining the roadway. Apparently, the people even lazier than us were all congregated near the turnoff, while the people motivated to arrive early (and unencumbered by a 10 a.m. girls 8-and-under soccer game) had caught the shuttle buses to the top. 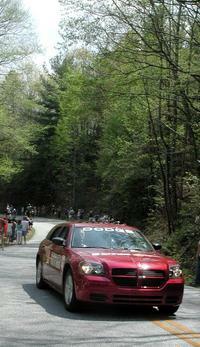 The car is the official pace car of this year's Tour de Georgia. It's the 2005 Dodge Magnum wagon, and yes, that thing does have a hemi. (With this and all the pictures in this post, you can click for a larger pop-up image). It turned out we were fairly well-positioned. Late in the stage, Alessio Galletti of Domina Vacanze jumped out to about a 4 minute lead, and took the King of the Mountain points at Hogpen Gap. The final climb of the day was about 20 kilometers, culminating with the 5+ kilometers up to the top. At 5 km to go, Galletti still had his lead (see the picture), but the pack was just down around that bend, about 35 seconds behind, and closing fast. Next came the motorcycles, and we got a look at the whole story of the race in one picture: working from right to left, we've got Daniel Rincon pacing race leader Lance Armstrong. Just behind him, in green, is Chris Horner of Webcor, who would finish 4th on the day and 3rd in the race. The paired CSC riders are Bobby Julich, who finished 6th at Brasstown Bald and 4th overall and Jens Voigt (2nd on the day and for the race). There's just the hint of an unidentified yellow helmet on Voigt's other side, then Scott Moninger, who was 5th on the climb and 7th overall, and just coming into view, in orange, Cesar Grajales of the Athens-based Jittery Joe's team, who rode away from this group less than a mile later to score the stage win. He finished 6th for the race. Close behind this group were some of the leaders' seconds: George Hincapie of US Postal, Charles Dionne of Webcor, and King of the Mountains jersey Jason McCartney of HealthNet, all in danger of losing the lead group. They weren't alone, as some very strong riders came through onesy-twosy: Max Sciandri, Pavel Padrnos, Jakob Piil, Antonio Cruz. A lone Barcoworld rider came through just before the ambulance, leading me to think we might seen everyone, but someone along the course said there was still one more group to come. Sure enough, a team car pulled up about 30 yeards to our right, and out popped the soigneurs for Domina Vacanze, setting up to hand bottles off to their riders. Six or seven minutes behind the stragglers of the lead group, the gruppetto (the laughing group) of about 30 riders came through, with 3 or 4 Domina Vacanze riders angling to get right in front of us. 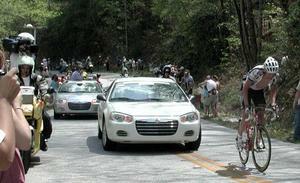 One of them was former world champion Mario Cipollini, who was not enjoying a 20-kilometer climb. Damon Kluck of US Postal was riding alongside. We were able to get out of there very quickly, since the shuttle buses from the top couldn't even start running until well after the race was over. We took the chance to head over to Athens for Saturday night's Twilight Criterium, celebrating its 25th Anniversary. During my freshman year (1985-86), I lived on the 4th floor of Reed Hall (right next to Sanford Stadium) with a bike-crazy roommate (I didn't ride then). He had worked in a shop in Atlanta, and somehow invited the Killians Red team, which featured brothers Alan and Frank McCormack, to stay in our TV lounge. Somehow, they accepted. They provided the post-race keg, and my roommate got a jersey out of it. If you ever have a chance to see it, don't miss it: Thousands of people line a circuit in downtown Athens, and the race almost never takes off before dark, so the riders are flying through under the downtown streetlights. Lance Armstrong wrapped up the second annual Tour de Georgia Sunday, as the sprinters' teams controlled the pace, and HealthNet's Gord Fraser took his second stage win of the Tour, ahead of Juan José Haedo from Colavito and Mario Cipollini of Domina Vacanze. Fraser secured the overall sprint jersey by taking first at both intermediate sprints and on the finish line today. Jason McCartney (also of HealthNet-Maxxis) won the King of the Mountains jersey based on his epic ride on Stage 5. Kevin Bouchard-Hall of the TIAA-CREF/USA Cycling team won the under-23 jersey. As they seem to just about everywhere, CSC won the overall team classification. Mario Cipollini, who appeared to be set up for the sprint today and finished 3rd, didn't show for the presentation, and was fined 200 Swiss francs and his day's winnings for it. Domina Vacanze representatives said Super Mario didn't realize he had finished 3rd, and therefore didn't think he needed to make the presentation. Domina Vacanze announced the former World Champion Mario Cipollini will be on the starting line for the Tour de Georgia, beginning April 20th. Cipollini will be using the race as preparation for the Giro d'Italia, which begins May 8th in Genoa. "The Tour de Georgia will provide good preparation for me," Cipollini said. "The course is challenging and the race finishes ten days before the start of the Giro (which is) very good timing." Domina Vacanze also will bring David Clinger, who won a stage of last year's Tour de Georgia. AFP reports that superstar sprinter Mario Cipollini of the Domina Vacanze team will not start Sunday's Tour of Flanders or Wednesday Ghent-Wevelgem, which Cipollini has won three times. Domina Vacanze officials did not reveal the reason for the 37-year-old Cipollini's withdrawal. It's easy enough to speculate on the reason. For the second time this season, Alessandro Petacchi has scored back-to-back stage wins, and he's beaten Mario Cipollini in all four of those stages. Naturally, Petacchi leads the overall (since he's won both stages so far). That's likely to change tomorrow, as the race heads into the mountains. Cipollini still says he'll beat Petacchi, pointing to Milan-San Remo March 20th. Alessandro Petacchi continued his winning ways with a sprint win in Sabaudia, at the finish of the first stage of Tirreno-Adriatico. 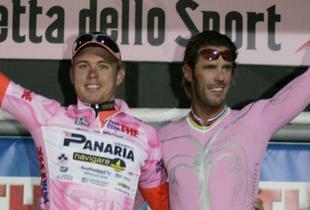 The win was the 60th of Petacchi's career and the 3rd of the season, joining two wins in February's Tour of Lucca. "You ask me if these wins can affect the morale of Cipollini, but I'd answer you that I'm thinking first of my morale and that of my team-mates. I don't worry about what others are doing," Petacchi told reporters after the race in the small seaside town, 75km south of Rome. From the Daily Peloton, proof that stat freaks are to be found in other sports than baseball, as Marianne Werz O'Brien breaks out the careers of sprinting superstars Mario Cipollini and Alessandro Petacchi, comparing their records by year and prestige. The 30-year-old Fassa Bortolo rider crossed the finish line of the 173km second stage ahead of compatriots Fabrizio Guidi and Mario Cipollini. More complete results are available at DailyPeloton.com. Alessandro Petacchi started his season much as he finished last year. Petacchi, the world’s best sprinter, beat Mario Cipollini at the line to take the first stage of the Tour of Lucca (Cipollini is actually ahead in the picture at left, taken after the riders crossed the line). Petacchi had 24 victories last year, including 15 in the three major tours (of Spain, Italy and of France), and became the first man to win 3 stages in each of the tours.